Tidal power or tidal energy is that alternative energy source of hydropower from which you can generate electricity. As tidal energy doesn’t produce any greenhouse gases, you can call it as a clean energy also. Actually, tidal energy is available to humankind since from the generation of the ocean. Still, this sustainable energy source is overlooked by hydro engineering sector for many years. Especially the tidal power utilization in India is very low. India has a huge potential to harness tidal energy as it got a large seashore. But the utilization of tidal energy in India for generation of electricity is considerably low. If Indian Government looks to harness tidal power, it will also open a new job market. Tidal Electricity is alternative energy sources available to cope up increasing demand for electricity. It is also a clean energy form as like hydroelectric energy. 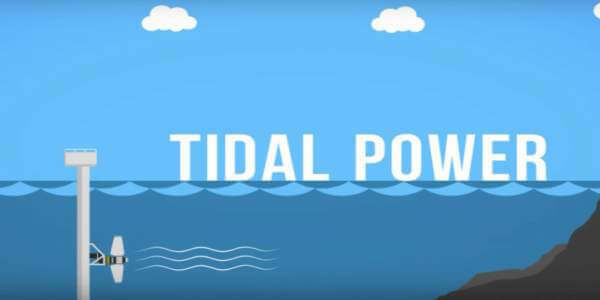 In this post on the tidal power, you will get all the information about what is tidal energy, how to capture the tidal energy, tidal power plant working, tidal energy facts, tidal energy advantages and disadvantages, the scope of tidal energy in India and much more. So, let’s start to dive deep to know more about a sustainable energy source called Tidal power. Tidal power, also called tidal energy, is a form of hydropower that converts the energy of tides into electricity. When the earth and the gravity of the moon line up with each other, cause millions of gallons of water to flow towards the seashore. This creates a high tide. Likewise, when the earth and the gravity of the moon are at 90 degrees to each other, the water flows away from the shore. This creates a low tide. A large amount of energy within the tides of the ocean is known as tidal power or tidal energy. Tides are more predictable than wind energy and solar power. But due to the limited availability of sites with sufficiently high tidal this renewable energy source is rarely used to produce electricity. However, many recent developments in turbine technologies can capture the more tidal energy and generate low-cost electricity. As tidal power generation is relatively new, there are not a lot of tidal energy companies out there developing the technology yet. However, there is several tidal power plants are in use and commercial tidal energy power plants are increasing. So, let’s start with tidal energy generation. The tides in the sea are harnessed in a similar way using waterwheels and turbines to that used to generate hydroelectricity. But because the tides can flow in both directions in a tidal energy system, it can generate power when the water is flowing in and also when it is ebbing out. Therefore, tidal generators are designed to produce power when the rotor blades are turning in either direction. The tidal electricity generation from tides is similar in many ways to hydroelectric generation. The difference in tidal energy generation is that the water flows in and out of the turbines in both directions. The motion of the tidal water contains large amounts of kinetic energy in the form of strong tidal currents called tidal streams. These streams are used for tidal energy generation in a tidal power plant. 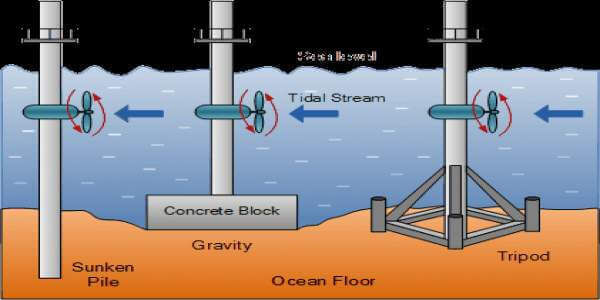 A tidal stream generator, also known as a tidal energy converter (TEC), is a machine that extracts energy from tides. Tidal streams are formed by the horizontal fast flowing volumes of water caused by the ebb and flow of the tide. Hence tidal stream generators make use of the kinetic energy of moving water to power turbines. This is an exact same way to wind turbines that use wind to power turbines. A Tidal Stream Generation system reduces some of the environmental effects of tidal barrages by using turbine generators beneath the surface of the water. Tidal stream turbines generate tidal power on both the ebb and flow of the tide. As water is much denser and has a much slower flow rate, tidal stream turbines have much smaller diameters and higher tip. The Tidal barrages are among the oldest methods of tidal power generation. 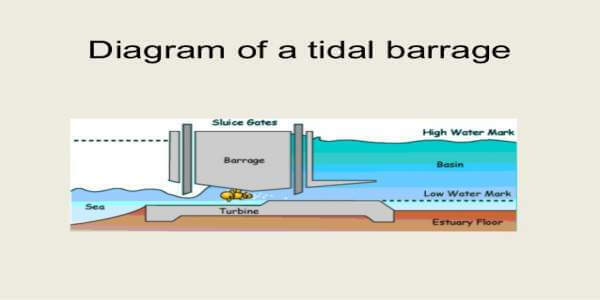 A tidal barrage is a dam-like structure used to capture the tidal energy from masses of water moving in and out of seashore. Barrages have a number of underwater tunnels cut into its width allowing sea water to flow through them in a controllable way using sluice gates. Tidal barrages generate electricity using the difference in the vertical height between the incoming high tides and the outgoing low tides. As the tide ebbs and flows, sea water is allowed to flow in or out of the reservoir through a one-way underwater tunnel system. The flow of tidal water in and out causes the water turbine generators located within the tunnels to rotate. A tidal energy produced with special generators used to produce electricity on incoming and outgoing tides. A tidal lagoon is another form of the tidal power plant that generates tidal electricity from the natural rise and fall of the tides. 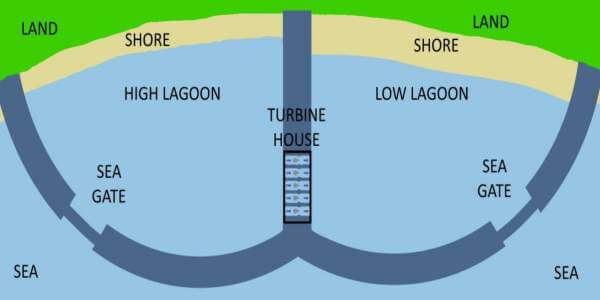 Tidal lagoons work in a similar way to tidal barrages by capturing a large volume of water behind a man-made structure which is then released to drive turbines and generate electricity. The size and shape of the lagoon depend on a lot of factors. This includes the tidal range, water depth, environmental impacts, and navigation. All have a big influence on which locations are suitable to build a lagoon. A tidal lagoon encloses an area of coastline with a high tidal range behind a breakwater. Dynamic tidal power or also known as DTP is an untried but promising technology for tidal energy generation. In this tidal power generation, a T shape long dam perpendicular to the coast is constructed. This long T-dam would interfere with coast-parallel tidal wave hydrodynamics. This creating water level differences on opposite sides of the barrier. This drives a series of bi-directional turbines installed in the dam. A DTP dam is long enough to exert an influence on the horizontal tidal movement. This generates a water head over both sides of the dam. The head can be converted into power, using a long series of conventional low-head turbines installed in the dam. Tidal power has many advantages compared to other forms of renewable energy sources and some disadvantages also. First, we will see advantages of tidal energy then after the disadvantages of this ocean energy. Tidal energy is an environmentally friendly renewable energy source and doesn’t produce greenhouse gases. High tides and low tides are more predictable hence developing tidal power plant is affordable. The energy density of tidal energy is relatively higher than other renewable energy sources. Maintenance cost of tidal energy power plant is relatively low. 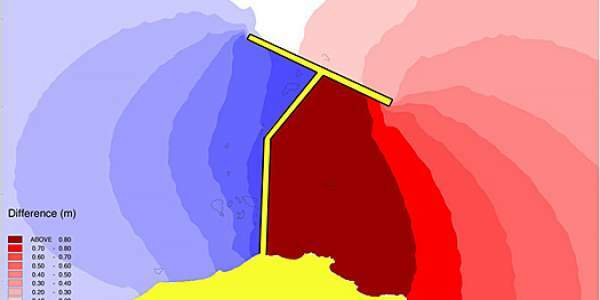 Tidal barrages provide protection against flooding and land damage. Low noise pollution as any sound generated is transmitted through the water. No waste bi-products are produced. Tidal power plants are established in ocean hence there is no need to occupy the land. So, migration of people is avoided. The estimated lifespan of tidal energy plants is about 75-100 years, which is much longer than nuclear power plants. Tidal Energy has a load factor of almost 80% which is equal to that of Thermal Power Plant. Tidal Energy can generate electricity only for ten hours a day during the ebb and flow of the tides. Construction of tidal power plant can change coastal structures in unpredictable ways. One of the largest disadvantages to tidal power is its large upfront cost. Tidal power schemes can only be built along the coast and even then not all coastal areas are suitable. Suitability is determined by tidal flow, tidal rise, ecosystem vulnerability, exposure to weather, and more. High power distribution costs to send the generated power from the submerged devices to the land. There is high maintenance cost involved in harnessing the tidal electricity due to salty sea water. According to the estimates of the Indian government, the country has a potential of 8,000 MW of tidal energy. This includes about 7,000 MW in the Gulf of Cambay in Gujarat, 1,200 MW in the Gulf of Kutch and 100 MW in the Gangetic delta in the Sunderbans region of West Bengal. But despite the huge potential, India has no policy on tidal energy. With all above information, will you think, tidal power is one form of wave energy? Put your thoughts in comments.